Histories of 16th-century art in France typically devote entire chapters to the Galerie François I at Fontainebleau or the châteaux of Philibert de l’Orme, but seldom more than a footnote to manuscript illumination. This art-historical lacuna is authoritatively redressed by Renaissance Manuscripts: the Sixteenth Century, fruit of a lifetime’s research by the late Myra Orth, a curator at the Getty Research Institute. Like previous contributions to this ambitious Harvey Miller series, it comprises two substantial volumes: the first with brief introductory essays, illustrations and succinct biographies of artists, scribes, authors and patrons. The second provides full catalogue entries on 100 manuscripts made between 1516 and 1574, plus indexes and a bibliography. This layout necessitates close reading and frequent cross-reference, amply compensated for by an enthralling level of detail that makes an immense contribution to Renaissance studies. For half a century after the end of the Hundred Years War, the preferred residence of the French court was at Tours. Paris reclaimed its position as the centre of deluxe book production only after the accession of François I (1515-47). Printing had been introduced to France in 1470, but the wealthy continued to commission prayer books and receive opulent presentation copies of new works. Manuscripts were generally supplied by a bookseller or publisher, who supervised the scribe, illuminators and painters. A third of those catalogued by Orth belong to that traditional “best seller”, the book of hours. Their texts were made more uniform by the growing popularity of printed prayer books and the Sorbonne’s ban in 1525 on the translation of prayers into French, and their figurative repertory became dependent on engravings by Dürer and after Raphael. Nevertheless, many were decorated to a superlative standard by such artists as the so-called Doheny Master and the Master of the Getty Epistles. The mother of François I, Louise de Savoie, commissioned François Desmoulins’s Commentaires de la Guerre Gallique (1519-20), based on Caesar’s account but written in the vernacular because of the king’s indifferent Latin. This was decorated with elegant grisaille miniatures by Godefroy le Batave and life-like portraits of the French commanders at the Battle of Marignano by Jean Clouet. Both artists came from the Low Countries, as did the leading Parisian “master painter”, Noël Bellemare. Their Flemish origins help to explain the appearance in French books of figures copied from Antwerp Mannerist drawings. 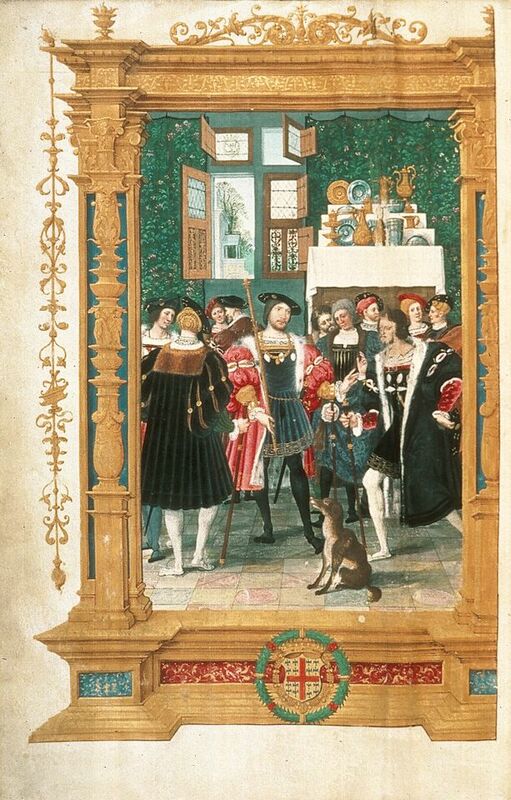 Resplendent scenes of court life in the 1530s adorn presentation copies of Diodorus Siculus’s Histoire Universelle and Cicero’s Four Orations, showing François and his most powerful baron, Anne de Montmorency, each at the centre of a galaxy of courtiers. Like the king, his bluestocking elder sister, Marguerite d’Angoulême, was sympathetic to religious reform, and the text and miniatures of her pious Initiatoire Instruction (1527-30) have a distinctly evangelical tone. A prolific poet, she presented friends with illuminated copies of her autobiographical lament The Coach. Verse was also composed by members of the Third Estate, including Rouen bourgeois and mariners from Dieppe, as well as court orators. A volume of their prize-winning Chants Royaux, delivered annually at the competitions of the Confraternity of the Immaculate Conception in Rouen between 1519 and 1528, depicts recondite allegories and religious subjects, as well as everyday scenes, including a lively representation of a printer’s shop. The circle of Italian artists whom François I established at Fontainebleau included Luca Penni and Niccolò dell’Abbate, who contributed to religious manuscripts for Henri II (1547-59) and nobles such as Montmorency and the Duc de Guise. By mid-century, French book design had become distinctly Mannerist, with borders of scrollwork, swags and masks, and landscapes replete with obelisks, banded columns and circular temples resembling the Pantheon. Inspired by the abundant classical remains of his native Lyons, Guillaume du Choul composed a volume of Antiquités Romaines with wash drawings copied from coins and medals and Italian engravings. Antiquarian research on seals and medieval tombs gave historical authority to the splendid full-page miniatures of the kings of France since Merovingian times in Le Grand Recueil des Roys de France, presented in 1566 by the royal secretary Jean de Tillet to Charles IX (1560-74). The independent portrait miniatures by Jean and François Clouet, set in precious lockets to serve as princely gifts, derived from the likenesses of the heroes of Marignano contained within the Commentaires de la Guerre Gallique. This process was turned on its head around 1580 when the dowager queen Catherine de’ Médici pasted four oval miniatures by the English artist Nicholas Hilliard into her Book of Hours to join the 34 family portraits originally made for it. Thus, a prayer book became a portrait album. Manuscripts provide numerous such insights into the sensibilities of their long-dead owners. Those catalogued here have beguiled many later collectors—six belonged to the legendary William Beckford (1760-1844), builder of Fonthill Abbey. Thanks to the research of Myra Orth, these ravishing Renaissance treasures are now accessible to a new generation of connoisseurs.